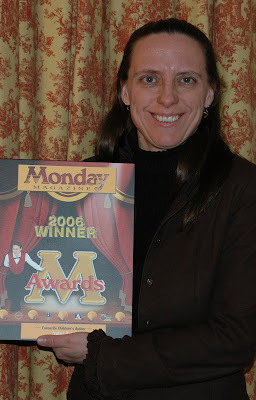 Thank you very, very much to all those who filled out ballots and voted me Favourite Children's Author - 2006! Attended the M Awards held downtown in Victoria this evening and received the award (a fancy plaque rather than a sculpted trophy... I will post photos of both - you can decide which you like best!) The only bad thing was that the other contenders are good friends - Penny Chamberlain and Sylvia Olsen were also nominated and certainly either one could have taken top honours! Way to go, Sono Nis Press for being the publisher for all three of us! Diane sure knows how to pick 'em! The first draft of the vet book will be with the editor for a bit, which is fine - gives me a chance to get some research happening on the ranch title, finalize photos for the vet text. Meanwhile, over at the racetrack, the marketing people and some buyers are having some issues with the title 'Behind the Scenes at the Racetrack.' The concern is that the title suggests our intention is to introduce small children to the world of parimutuel betting. In fact, the book is really about racehorses - where they come from, how they are trained, what their lives are like at the track, what happens to them after their careers are over. So, an eleventh hour (as far as I know, the book has already been sent to the printer) decision has been made to change the title of the book. Yikes! I can only imagine the trouble this is causing at head office, for the marketing people, for the bookstsores that have already ordered the book with the original title... The new title? Racehorse: Behind the Scenes. The vet book now becomes Horse Vet: Behind the Scenes. And so on. Which does put the emphasis back on the horse, which is a good thing. My goodness, it's all so stressful. But, it will all work out fine as long as lots of people buy the books! Hint. Hint. Know any horse lovers out there? You can't start planning for Christmas too soon! Quite the productive day yesterday - finished up the first draft of Behind the Scenes With a Horse Vet and sent that off to the editor. Spent a bit of quality time with my horses and wrote up a list of shots/dialog to be filmed on Tuesday when I see Karen again. And, last night, saw Manufactured Landscapes, the Jennifer Baichwal film about the photographic work of Edward Burtynsky. 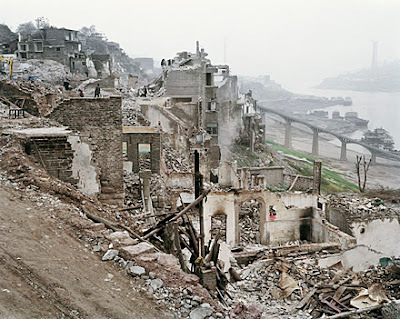 Here is one of his photographs taken at the Three Gorges Dam Project in China where whole cities are being dismantled and more than a million people relocated to make room for the world's largest reservoir. Visit Burtynsky's website for many, many more stunning landscapes that have been created by people. The film is powerful. Burtynsky's photographs potent. I couldn't help thinking (as we drove home in our gasoline-filled car) how isolated we are from so much of the devastation we (collectively) have brought to our planet. Anyway, a really interesting film with an unforgettable opening sequence (shot in a Chinese factory). Here's a little video meant as a triubte to (and good luck message for) Karen Brain. The biography is still with the editor, but with any luck I will have that back soon so I can move forward with the editing/rewriting process. I had a lot of fun making the mini-movie and have plans for several more (including at least one more about Karen, probably telling a bit more of her story). And the winner is... (or, more properly, the winners are...) listed here on the Cybils website. Congratulations to all the winners - and, a special congratulations to Melanie Watt for walking away with top honours in the Fictional Picture Book category. Scaredy Squirrel is a big hit with my relatives (young and old) and certainly deserves to win! What would you pay to hang onto the random stuff you've collected throughout your life that you want to keep but it doesn't fit in your house? Many of the people I met chose to pay in excess of $40,000 for tangible memories. It seems like there a storage complex on nearly every corner. What is everyone hanging on to and why? Speaking of complexes, every time I try to get rid of something, I hear myself saying I'll need it as soon as I get rid of it." "There's nothing wrong with it." "It was a gift," and so many more justifications. I needed to know if I was alone in my attachment. In STORE, we 'pass the baton' and tell our stories in concert. Rather than focusing upon a few detailed stories, we share a few details from a lot of stories. In short, we discuss why simply having is so important to us all. Anyone who knows me (and who has fallen over my stuff...) will be chuckling at this point. But, yeah - the filmmaker saw straight into my heart! One of the great pleasures of attending world premieres of films (and tonight was the official premiere for STORE) is that one gets to meet the director. In this case, Cami J. Kidder (who wrote, directed and produced the picture, and is a first time feature director) was in attendance. She stayed behind after the screening to chat and answer questions. And, yes, she still has stuff in a storage locker. Bayside Middle School has been hosting their annual Reading Week for ten years or so, each year instroducing every student to authors, illustrators, and storytellers. 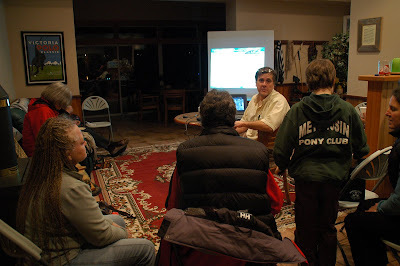 Over the years I've presented writing workshops, author talks, and 'Lunch With the Author and her Pony' sessions... 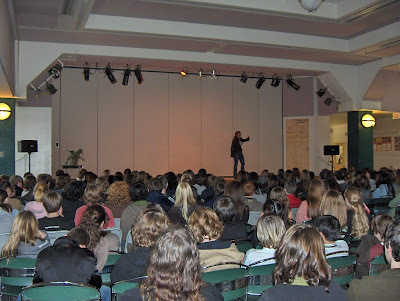 This year all the Grade 8s (about 250 of them) gathered in the multi-purpose room while I told one of my favourite stories in the King Arthur series - The Marriage of Sir Gawain. Thanks are due to librarian Vivian Hicks and all the staff and students at Bayside who make this such a fun annual event! Hope to see you again next year! I LOVE the Victoria International Film Festival, look forward to it every year, and never have enough time to see all the fabulous films that flit through town! To put ourselves in the mood last week, we went to see Children of Men - which was very good - riveting and disturbing. NOT light entertainment and not exactly fun, but well worth seeing. So far at the film festival, I've attended a couple of panels for filmmakers (hard though it is to believe, film is an even wackier business than publishing!) and seen two movies - The Gymnast (in honour of Dani's lost career) and Singing Down the Bones (in honour of poets everywhere). Tonight we're seeing a double-header - Fido (because everyone needs a zombie around the house) and Babel - just because it's supposed to be great (not part of the festival, it's playing tonight at Cinecenta). Now I like ebay as much as the next guy (did you know there are people who will buy unused Starbucks coffee cards? Canadian designs are particularly popular, apparently - not so many of them around), but have you heard about the guy in Wollongong who has sold his life? Not only does the winning bidder get the basics like his name and phone number, he also becomes the proud owner of a repertoire of six jokes and a fractured relationship with an ex-girlfriend. If the sale goes through (the top bidder at $7500 is presumably someone who has no life...) Holt (or the ebayer formerly known as Holt - who will he become after he's sold his life?) wants to make a documentary about the process. Now that's a movie I'd like to see! receiving an M Award nomination (for Favourite Children's Author), learning that Trouble on Tarragon Island has been short-listed for a Willow Award (Saskatchewan Young Readers Choice Awards), and seeing the final layout of Behind the Scenes at the Racetrack (which we will see one, final time at blueline stage). A young girl, living in the whimsical, imaginative world that only Gabi Swiatkowska can create, anticipates with great excitement the birth of her cousin, only to grow increasingly confused by her family's peculiar responses to her questions about exactly how and when the baby will arrive. I must say, we are having a good discussion about what makes a great picture book! Selecting a winner from this list is not going to be easy!